The Weekly Menu Board – Jay Luker – Really? ... Wow. 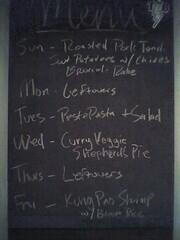 A shot of our new weekly menu chalkboard from earlier this week. Things don’t always go as planned, however. Shephard’s Pie ended up on Tuesday, and Wednesday dinner consisted of Fenway Franks and $7 beers. Yep, that’s right–we managed to score tickets to Game 1 of the Red Sox vs Angels playoff series. Thanks Doug & April!